Warm Handmade Crafts is the ticket when the winter woollies are looking desirable and the cold snaps become a little too frequent and "brrr" is the involuntary word of the day. This is the first in a series of little hand warmers for 2012. Not only has there been days when Mr Nippy has come nipping around our noses, toes, and fingers - but I was also given the incentive through requests to make some Fingerless Gloves for some hardworking beauties over in UK and Ireland. The photo below has caught me in an "escape mode". But I have included this as it serves a good purpose - to give a better look at the length and fit of these gloves. 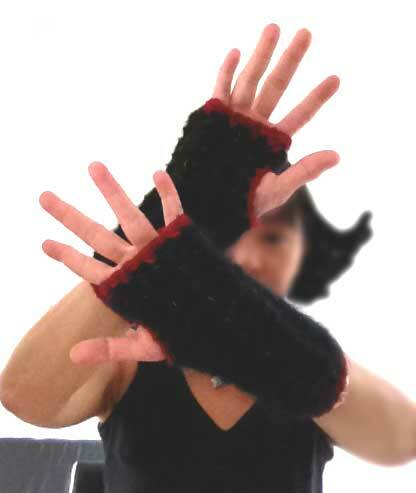 The fingerless gloves are ideal for anyone who needs to be able to use their fingers while keeping their hands and wrists warm. I love fingerless gloves and mitts. In the cold, my fingers get really chilly and worse, they get stiff. That makes it virtually impossible or at best, very hard to bead tiny beads, to knit, crochet, sew, and even type smoothly on the keyboard. 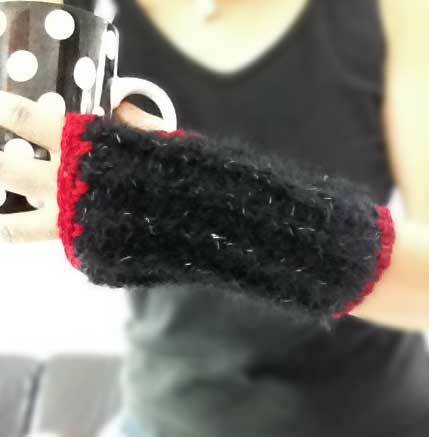 If you have never used a fingerless gloves but feel the chill in your hands, then this is a must for you. You will be amazed at how much warmer your hands become and as a consequence, your fingers can also function with nimble mobility again. 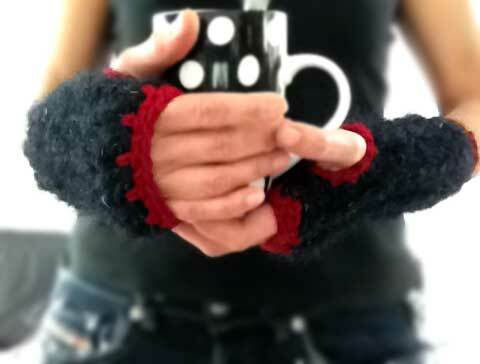 I used Sunbeam, Paris, Mohair for this pair of pair of fingerless hand warmers, with a warm accent in red at the edges. This was crocheted in a rib stitch. 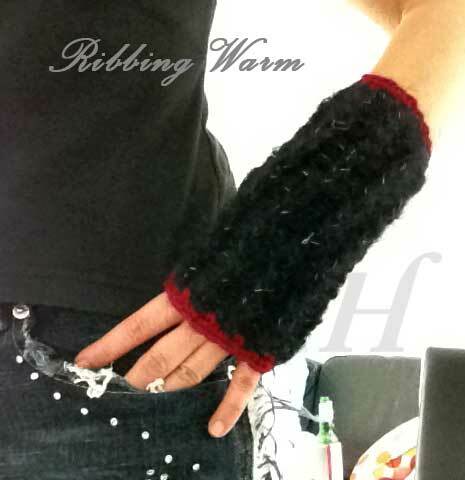 The crochet rib stitch gives the gloves more body, bulk, warmth, and a longer lasting snugger fit. The Red Black contrast is dramatic, bold, and visually warming. There are strands of fine opalescent fibers running through the black mohair yarn - a touch of elegance and class in the midst of toasty warmth.